The Beach Bladers began in 1990, when several people who regularly skated along A1A in Delray Beach got to know one another and decided to get organized. Today the club continues to welcome experienced and novice skaters from all over South Florida. We have regularly scheduled skates several times a week that center around the Boca-Ft. Lauderdale area, although we'll go as far north as West Palm Beach and south to Miami Beach to take advantage of great skating opportunities. 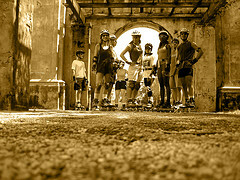 In addition, we plan weekend skating trips, parties, marathons, clinics and more. 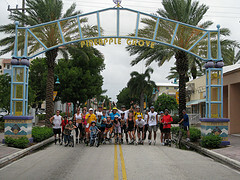 We participate in joint events with the South Florida Inline Skating and Social Group, the Sobe (South Beach) Rollers and other local skating groups. An important part of the local skating community are the local chapters of the National Skate Patrol. Members conduct free braking clinics, offer tips on skate etiquette and otherwise assist new and experienced skaters. The NSP also helps skaters to better coexist with auto traffic, cyclists, pedestrians and other street and trail users. Look for these red-shirted volunteers at our Beach Blader events. "To promote the sport of inline skating by having fun, getting great outdoor exercise, meeting regularly to skate with friends and meet new people, improving our skating skills and helping others do the same."